Many diabetes sufferers have feet and ankle problems, with nerve damage an especially serious problem. 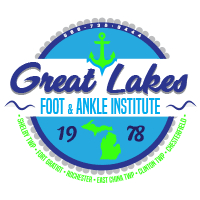 The podiatrists at Great Lakes Foot and Ankle Institute PC are diabetic foot care experts, and they’re ready to help you with symptoms like pain, burning, and numbness. Schedule your visit now at the Chesterfield, Clinton Township, Fort Gratiot, East China Township, Shelby Township, or Rochester, Michigan, location through the online tool or by phone. How is diabetes connected to foot problems? If your diabetes isn't well-managed, you can suffer from nervous system damage and organ damage. When you have nerve damage, you're less able to feel sensation in your feet. You may not notice pain, heat, or cold unless it's severe. You may also have cuts or blisters that never get treated because you don't feel them, and this can lead to diabetic foot ulcers and other foot issues. In severe cases, diabetes sufferers can lose toes, feet, or even their leg due to uncontrolled diabetic foot problems. For this reason, it's very important that you closely monitor your feet for issues. When should I see the podiatrist about diabetic foot problems? Good diabetic foot care includes yearly visits to your Great Lakes Foot and Ankle Institute PC podiatrist. Your podiatrist performs a thorough evaluation and monitors any ongoing issues with your feet and ankles. Schedule an additional urgent care appointment if you start experiencing problems like swelling, bruising or other discoloration, foot pain, or slow-healing wounds on your feet. What can I do for diabetic foot care at home? Your podiatrist may have additional tips to help you enjoy optimal foot health in spite of your diabetes. Of course, it's also crucial that you see your primary care doctor on the established schedule to make sure your diabetes is properly managed through lifestyle, medication, or supplemental insulin. Do I need surgery for diabetic foot issues? In many cases, you don't need surgery. Your podiatrist can often treat problems like diabetic foot ulcers very effectively with topical ointments or creams, bandaging, oral medication, and other solutions. You may also need orthotics to help you relieve pressure on the ulcer. If you have severe diabetic foot disease, you may need surgery to remove dead skin, or to shave the bone surrounding your ulcer. Surgery can also correct co-existing issues that make the diabetic foot problems worse, such as hammertoes or bunions, for example. Use the online scheduling tool or call now to book your appointment at the Great Lakes Foot and Ankle Institute PC location nearest you.